This CCTV video lens with beautiful appearance, good hand feeling and excellent work performance. It&apos;s a good replacement for your old CCTV camera lens, suitable for portrait, landscape, video clips, macro, sketches and other shooting. It is your cost-effective choice. 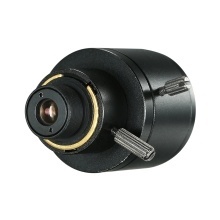 *It is your ideal replacement for your broken or damaged CCTV video lens. *With fine workmanship and professional-grade material, it features good hand feeling, excellent work performance, excellent for long-term use. *Adopting up-to-date electronic components, it can well meet your professional demands. *With 3 Megapixel high definition image, good color reduction and small distortion. It provides wide and clear vision for your vidicon. No IR-Cut Filter. Letter IR on the lens means infrared ray.